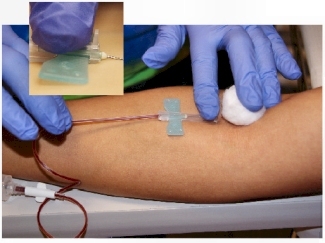 The K-Shield Butterfly may be used with a syringe or with a Vacutainer™ with an adaptor. After cleaning the site, puncture the vein and engage the Vacutainer™ tube into the holder and allow blood to fill the tube. Keep the butterfly parallel with the arm. Do not lift up on the butterfly. Unnecessary pressure on the cotton ball or the device will cause more pain for the patient. Place the cotton ball over the injection site without applying pressure. Gently place the index finger on the shaft of the butterfly behind the raised stop guard. Gently pull the tubing straight back and the needle will withdraw from the vein and be covered by the shaft. When the needle is withdrawn, immediately apply pressure to the site.